Posted on 3rd February, 2018. An international group of astrophysicists has solved the mystery of the powerful burst in CTA-102 blazar, registered in December, 2016. The scientists found that the amplitude and duration of such bursts depends not only on physical parameters of the radiating area, but, foremost, on geometrical features of the jet – a string of plasma that originates from blazar center hosting a supermassive black hole. The research published in Nature (doi:10.1038/nature24623), involved a Kazakhstani astrophysicist Kenes Kuratov, who is the lead researcher in FAPHI and the docent in Al-Farabi Kazakh National University. It was found that changes in different wavelengths were asynchronous. 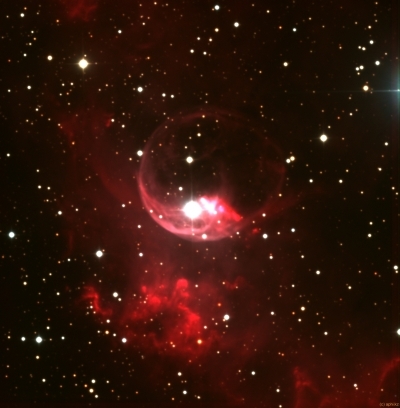 This, during the burst in CTA-102 in 2012, the radio emission lagged behind the optical one, but in 2016 the situation was different – the radio emission preceded optical photons. This suggests that emission in these ranges originates in spatially distinct parts of the jet. Besides, the jet itself is curved (it has a spiral-like structure) and changes its orientation permanently. 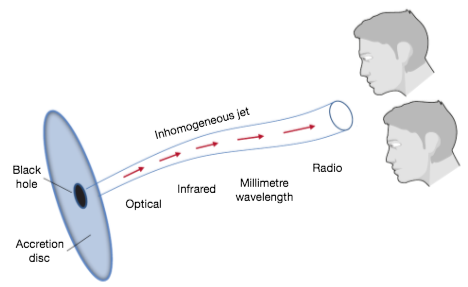 When the angle between the line of sight and the point from which the radiation at the given wavelength originates is minimal, we observe the maximal signal amplification, observed as a burst. This provides evidence that at least for some blazars the main factor defining burst amplitude and duration is the geometric characteristics of the jet rather than physical parameters of radiating areas.